As an engaged community partner, HHHunt believes it is important to positively impact the communities where we live and work. These efforts are part of our team’s continued commitment to fulfill HHHunt’s mission of improving the world and how people live. HHHunt team members from our Foxridge and Hethwood Apartment Living communities and the HHHunt Corporate office in Blacksburg recently participated in the United Way of the New River Valley’s Annual Day of Caring. 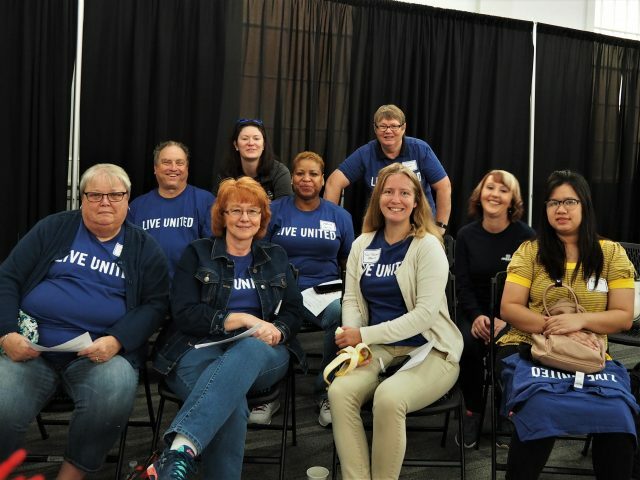 United Way’s Day of Caring promotes the spirit of volunteerism, increases the awareness of need within local agencies, and demonstrates that neighbors helping neighbors can create positive change in a community. As these values closely align with HHHunt’s own mission and values, our team members couldn’t wait to take part in the United Way of the New River Valley’s Annual Day of Caring. This was a unique opportunity for hands-on interaction with United Way’s local partner agencies that included soup kitchens, emergency food pantries, clothing banks, family shelters and child care centers, and agencies providing services to the intellectually and physically disabled. HHHunt team members performed a wide variety of tasks including meal preparation, reading to children, painting, mulching, and collecting food donations. We are thankful to those team members who participated in the Day of Caring and admire their continued commitment to improve the world and how people live by being an engaged community partner. To learn about other community engagement and How You Live stores, visit our website and follow us on Facebook!